Navigating the Journey of Aging Parents proposes an entirely unique approach to the field of gerontology, giving dependent care receivers a voice. Caregivers will be made aware of what care receivers truly want during life's final chapters. Exploring issues of housing, spirituality, personal care and death, Cheryl Kuba has created a testament to the dependent elderly. 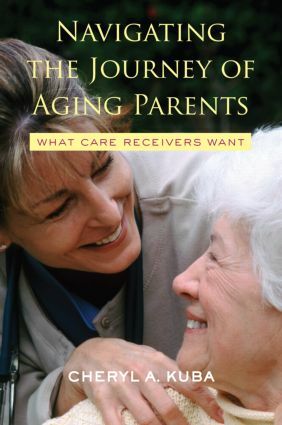 This book draws on numerous interviews with aging people and discusses common caregiver mistakes and interpretations, what a caregiver should expect when an aging parent moves in, and how to care for an aging parent from afar. Kuba also delves into such phenomena as guilt, role reversal, changing family dynamics, financial stress, and caring for oneself while caring for another. The 22.4 million elderly people being cared for in the United States comprises the fastest growing segment of the population, making this reference on the opinions and concerns of care receivers invaluable. Growing Old and Feeling Ill: A Permanent Condition? What About God? Is He Still Listening to Me at This Age?